Dezign With a Z Wall Clock is the new hip way to get the time. Both decorative and useful, these wall clock decals are totally easy to install. You are tired to choose between a round or a square wall clock? 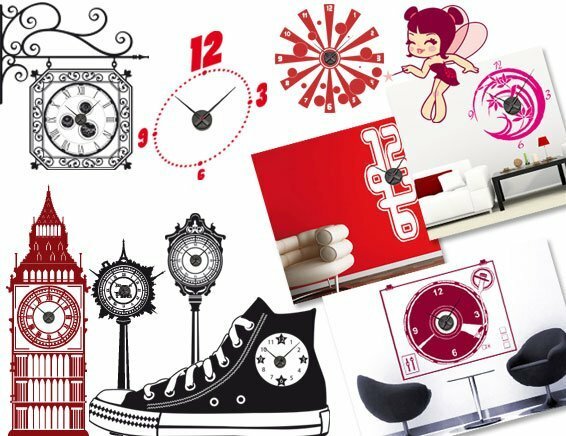 Dezign With a Z offers you a large panel of original designs for your wall clock: Bubble Clock decal, City Clock sticker, Giant shoe for your kids to learn how to read time... an unprecedented type of wall clocks are available to decorate your walls with decals. Time won't be the same anymore!!! But how to install a Wall Clock Decal? Is it difficult? No it's actually no more difficult than any classic wall clocks. First you stick the wall sticker on your wall as you would do with any other wall sticker (see our instructions decal section ). Then all you have to do is place the clock mechanism on the sticker decal itself. Voila! Wall clock stickers comes in different sizes from small to extra large and 24 colors available right away. The center clock mechanism itself is black. The wall clocks mechanism are100% silent, so you won't hear them at night. So no bad surprise if you plan to install it on your bedroom walls! The Wall Clock is delivered with the wall decal, the clock mechanism and the hardware needed to install it. The Wall Clock sticker works with AA battery (not included). If you need to have a custom size for you wall clock decal or a custom color, contact us directly.